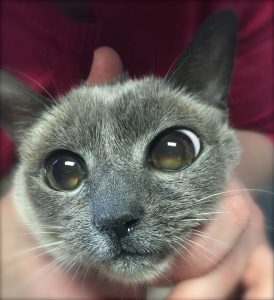 Lilly, an 11-year-old Siamese Blue Point cat had been experiencing congestion, sneezing, and coughing for the past year. Her family noted that at times she was very tired and had drainage from her left eye and nose. A CT scan and biopsy identified a lymphosarcoma involving the nasal cavity. Lilly had a cancerous tumor inside her nose. The treatment of choice for cats with lymphoma is radiation therapy followed by chemotherapy. Due to the location of the tumor, traditional radiation therapy was not an option. The family and veterinary team decided on stereotactic radiosurgery or SRS. SRS is an advanced form of radiation therapy that has a long history of success in human medicine. SRS offers significant benefits over traditional radiation therapy by delivering high doses of radiation with sub-millimeter precision in a non-invasive, non-surgical manner that requires only 1-5 treatment sessions as opposed to the 15-30 needed with traditional radiation therapy. SRS minimizes both the risks and side effects commonly experienced with traditional treatment options. Lilly 2 weeks after SRS treatment. In late October of 2015 Lilly received SRS treatment. 2 weeks after her SRS treatment Lilly is receiving chemotherapy and continues to improve. 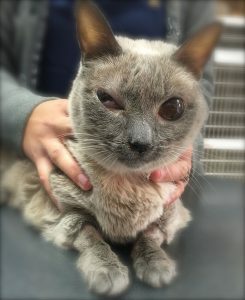 Lilly was treated at PetCure Oncology at Care Center in Cincinnati, Ohio.